Since October 18, 2003 (but we changed the name). Discussion today in the comments section of Rorate Cæli calls to mind the importance of the obligation of supporting the pastors. •not to marry within a certain degree of kindred nor to solemnize marriage at the forbidden times. Coincidentally, I came across an interesting discussion of the issue while looking for something else. This comes from an 1886 number of the Irish Ecclesiastical Record (3rd series, vol. VII, pg. 160). Note that "pastor's second paragraph refers to the different listings of the Precepts of the Church as recounted in the Catholic Encyclopedia article linked above. "The faithful are instructed by the Catechism that they are bound in conscience and in justice under the above precept to contribute to the support of their Pastors. "Would you therefore kindly inform me on the following points:—(a) Who are bound by it? Are (1) married women who may happen to be possessed of private means? Are (2) grown-up children who, though living with their parents, have a small salary or allowance of their own? Are (3) domestic servants, labourers, clerks, shop-assistants, et hoc genus omne, who find it a pretty sharp struggle to keep afloat? (b) How much are they bound to contribute? And (c) When or how often are they so bound? "It is noteworthy that this precept, grounded, as the Catechism states, on 1 Cor. ix. 14, is only to be found in poor, generous, Ireland; it is unknown in England, nor is it to be met with amongst the "praecepta Ecclesiae" in any handbook of theology I have "come across. It is perhaps due to this fact that so many Priests differ in answering, if indeed they answer at all, the above questions. St. Paul in the passage mentioned by our correspondent states and proves conclusively that those who preach the Gospel have a right to live by the Gospel. Such is the ordinance of Christ. Such too is the law of nature. If the minister of grace spends his life in attending to the spiritual wants of the faithful, those who expect and benefit by his holy services are assuredly bound, one and all, according to the means of each, to supply his temporal support. This is not merely a duty of sacrificing something to acknowledge God's supreme dominion, from a motive of religion; it is proximately a sacred debt of justice arising out of a solemn contract implied in the reception of baptism. The Church too, for her part, provides pastors on the understanding that the faithful will, as far as possible, secure them becoming maintenance in return for spiritual services. This, no doubt, is only an aspect ot the natural obligation. It suffices, however, to show how the Church could withdraw for a time .the ministrations of her priests, if no better means could be found of compelling her children to discharge the duty of maintaining their pastors. Happily, as our correspondent so truly hints, in Ireland there is only question of who in particular come under the law proclaimed in our Catechism. The commandment is intended to enforce by ecclesiastical authority in a definite way an obligation that comes already in substance from the natural and divine law. Our forefathers had stored permanent support in benefices and foundations for the priests of the land; but alien rapacity devoured the sacred inheritance and made it necessary for Irish bishops and councils to call on the people for such provision as was possible in the ruin that supervened. The system, in one sense voluntary, is in truth a modified application of tithe legislation and must accordingly be in some measure obligatory. To explain this inference we must go back a little. In the first centuries, though all priests could not hope to earn their bread by manual labour like St. Paul, the contributions of the faithful towards clerical support, were, for the most part, voluntary. First-fruits (primitiae) and offerings (oblationes), which were meant to meet the expenses of public worship and feed the poor, conjointly with maintaining the clergy, came without the asking. It was a time when charity gave more than justice could demand. But after some years the Church thought well to legislate on the subject, and enforce by her Canons the payment of certain customary contributions. Soon first-fruits fell into disuse, but the offerings of various kinds, some free, others of obligation, continued as before, and tithes were almost everywhere imposed. These tithes were of three kinds, prædial, mixed and personal, the latter falling on the produce of industry and labour and accordingly affecting all classes of persons. In Ireland the law began with the Synod of Kells before, and the Synod of Cashel after, the English Invasion. Although the Council of Trent endeavoured to protect them, tithes have gradually passed, in most countries, out of the hands of the Catholic priesthood. The general establishment of benefices and foundations had rendered them less necessary than before, and the hostility of governments hastened their disappearance. As a rule then the law of paying a fixed proportion of yearly produce has gone into disuse, or, as with ourselves, though it may still run "to pay tithes to the lawful pastors of the Church," it means to pay the dues fixed as a yearly contribution to our true pastors, since tithes properly so-called have been seized for another purpose. This is the least the Catechism implies, and we are now free to examine the precept in detail. 1. In Ireland the extent of contributions has wisely been left in great measure to the generosity of the faithful. Obligation seems to affect only the fixed dues or collections. Hence everything else is perfectly free so long as the priest is suitably maintained. But should he fail to derive from the appointed stipends such a living as becomes his position, the Commandment certainly intends to enforce the obligation that would at once arise from the natural law, and bind every parishioner according to his means, to help in supplying the pastor's wants. 2. Who are bound by the Commandment? As a rule those who are on the priest's list for annual stipends. The heads of families, male and female, are of the number. So in some instances are officials, clerks, and even servants. But usage varies for these classes, and everywhere allowance is made for peculiar circumstances, such as their means, the distance of their employment from home, the kind of contribution demanded. 3. Excusing causes are often present, and even if there he nothing to justify a refusal, we must think twice before proclaiming our rights. Voluntary offerings on other occasions may cover the obligation, or failure may be of rare occurrence. Again, the charm of a clergy maintained by the free contributions of the people should not be broken for a trifle. It is much better to keep the question of right in the back-ground. No reasoning on the subject, at least in a public and disputatious way, would improve the spirit of the faithful in regard to clerical dues. What is true of the people at large, on this head, is also applicable to the case of individuals. Unless there be good hope of success it is useless to proclaim and insist on rights in justice. At the same time laymen who know their obligations and refuse to discharge them, without any excuse or reason for supposing that the priest does not press his right, are plainly committing an offence against God, His Church, and the neighbour. But, owing to the voluntary character that in some measure has passed, to the whole system by which the priesthood is supported, a materia gravis is not so readily reached in these transactions as in ordinary dealings. Blessed Alan De la Roche who was so deeply devoted to the Blessed Virgin had many revelations from her and we know that he confirmed the truth of these revelations by a solemn oath. Three of them stand out with special emphasis: the first, that if people fail to say the Hail Mary (the Angelic Salutation which has saved the world) out of carelessness, or because they are lukewarm, or because they hate it, this is a sign that they will probably and indeed shortly be condemned to eternal punishment. The second truth is that those who love this divine salutation bear the very special stamp of predestination. The third is that those to whom God has given the signal of grace of loving Our Lady and of serving her out of love must take very great care to continue to love and serve her until the time when she shall have had them place in heaven by her divine Son in the degree of glory which they have earned. (Blessed Alan, chapter XI, paragraph 2). The heretics, all of whom are children of the devil and clearly bear the sign of God's reprobation, have a horror of the Hail Mary. They still say the Our Father but never the Hail Mary; they would rather wear a poisonous snake around their necks than wear a scapular or carry a rosary. Among Catholics those who bear the mark of God's reprobation think but little of the rosary (whether that of five decades or fifteen). They either fail to say it or only say it very quickly and in a lukewarm manner. Even if I did not believe that which has been revealed to Blessed Alan de la Roche, even then my own experience would be enough to convince me of this terrible but consoling truth. I do now know, nor do I see clearly, how it can be that a devotion which seems to be so small can be the infallible sign of eternal salvation and how its absence can be the sign of God's eternal displeasure; nevertheless, nothing could possibly be more true. In our own day we see that people who hold new doctrines that have been condemned by Holy Mother Church may have quite a bit of surface piety, but they scorn the Rosary, and often dissuade their acquaintances from saying it, by destroying their love of it and their faith in it. In doing this they make elaborate excuses which are plausible in the eyes of the world. They are very careful not to condemn the Rosary and Scapular as the Calvinist do - but the way they set about attacking them is all the more deadly because it is the more cunning. I shall refer to it again later on. My Hail Mary, my Rosary of fifteen or five decades, is the prayer and the infallible touchstone by which I can tell those who are led by the Spirit of god from those who are deceived by the devil. I have known souls who seemed to soar like eagles to the heights by their sublime contemplation and who yet were pitifully led astray by the devil. I only found out how wrong they were when I learned that they scorned the Hail Mary and the Rosary which they considered as being far beneath them. The Hail Mary is a blessed dew that falls from heaven upon the souls of the predestinate. It gives them a marvelous spiritual fertility so that they can grow in all virtues. The more the garden of the soul is watered by this prayer the more enlightened one's intellect becomes, the more zealous his heart, and the stronger his armor against his spiritual enemies. The Hail Mary is a sharp and flaming shaft which, joined to the Word of God, gives the preacher the strength to pierce, move and convert the most hardened hearts even if he has little or no natural gifts for preaching. As I have already said, this was the great secret that Our Lady taught Saint Dominic and blessed Alan so that they might convert heretics and sinners. Saint Antoninus tells us that this is why many priests got into the habit of saying a Hail Mary at the beginning of their sermons. This text taken from the electronic edition of The Secret of the Rosary published on-line by the Dominican Father's Rosary Center, the headquarters of the Archconfraternity of the Most Holy Rosary. It's important to contextualize this passage as not being absolutely universal. Eastern Rite Catholics, for instance, may not have the Rosary as part of their devotional culture. This is not a sign that they're all going to Hell. But for ordinary Latin Rite Catholics and especially any of us who would claim to be "traditional" Catholics (whatever that means) it's a different matter. eBay seller "shadesofgrey*" has posted two auctions for a total of three photos of monks at the Trappist New Melleray Abbey in Iowa. The photos were taken by Russell Trall Neville of Kewanee, Illinois. Neville, an attorney, was also a pioneering cave explorer and photographer. 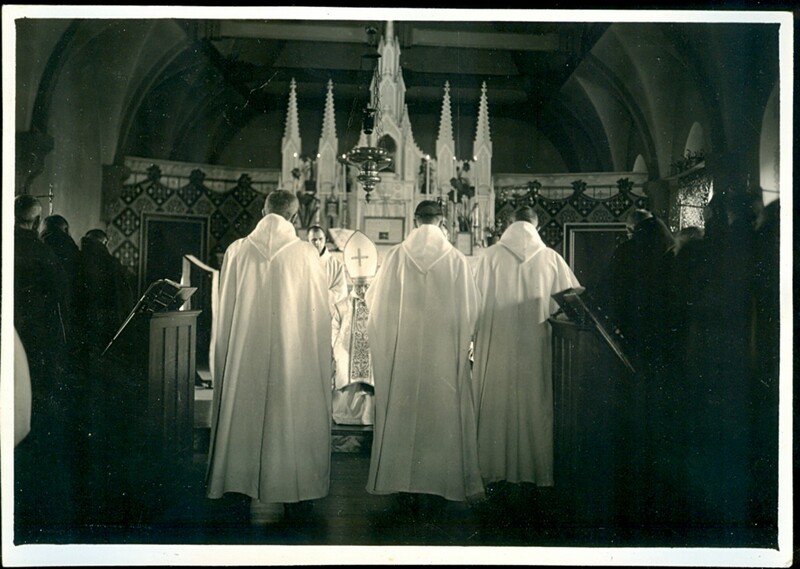 The Prior, second in authority in the Trappist Monastery, New Melleray, Poesta, Iowa, here presents two novitiates to the Abbot during the Solemn Profession service. The Prior commends them to the abbot and petitions him to permit them to make their solemn profession, which consists of assuming the final vow of the Order. This is one of the series of photographs, the only ones ever taken in a Trappist Monastery during a service of this character. The second auction is for two Trappist funeral photos. 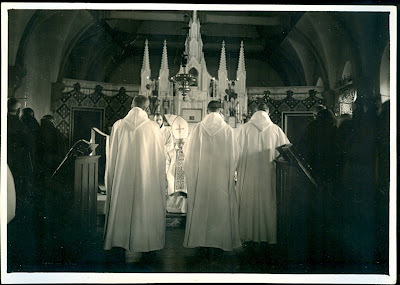 The first, taken during the vigil in the church, is captioned, "Brother Eugene, Sup-Prior, the third in authority ... during funeral services for a departed brother. The deceased is in his habit and will be buried without a coffin." The second is taken in the grave yard. Since the deceased brother is visible in the photos, I've put them below the cut.